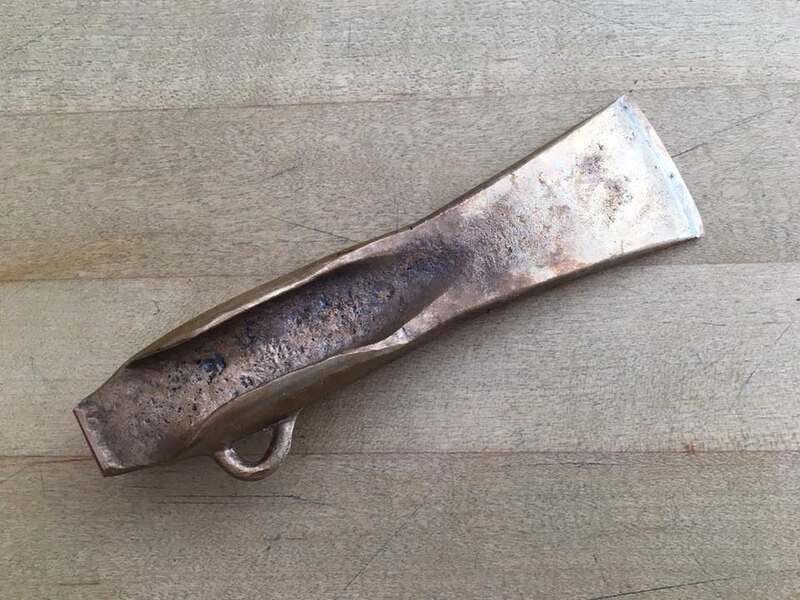 There have been a number of "Show Us Your XXXX" threads here over the years, but I am pretty sure there hasn't been one for Bronze Age Weapons. 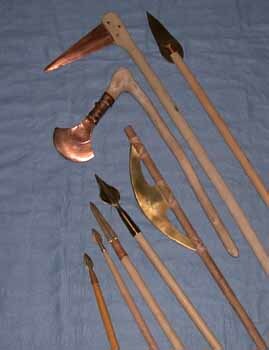 Show us your bronze swords, spearheads, daggers, axeheads, arrowheads, etc. Many of them will be by the master, Neil Burridge of Cornwall. and I bet we see a lot of Ewart Parks. I think that's most of them. Many Neil blades, generally hilted by me, some ground-down Albion boat anchors, a couple miscellaneous. Yes, I remember when Albion was selling bronze swords. They all looked mighty heavy. "Heavy" is the word. A few hours with the grinder helped a lot, but they're still not the right proportions, generally. 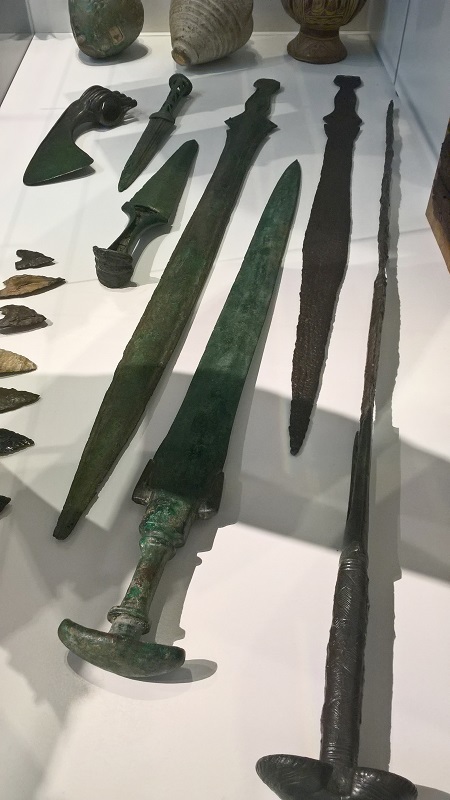 Though that big fat dagger they had (and I think still show in their Moat Sale) is what I used for my Early Bronze Age "halberd". Perfect for that, again after grinding off 2/3 of the metal. Is that massive spike-on-a-stick in your second picture what you're calling your "halberd"? I LOVE that thing! 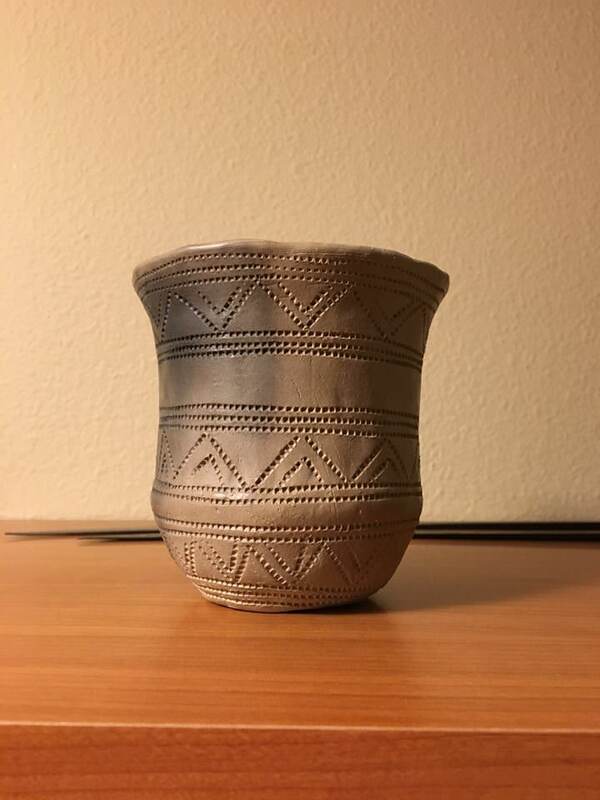 What are the measurements on it? Single-hand use or still heavy enough you'd want to use two? Also really like the antenna-hilt sword. The Ewart Park might be the "popular classic" out there, but I'm a fan of the quirky or different. Yup, "halberd" is the unfortunate Victorian term that we're stuck with. Most of us would prefer to call it a war-pick or something like that. 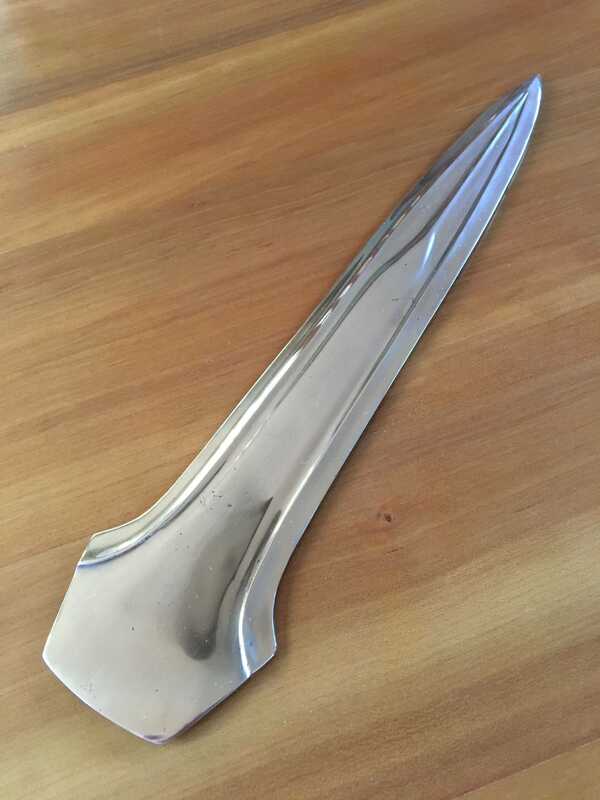 In German it's a Stabdolch, I think, "staff-dagger", which is pretty good considering that it's often hard to tell if those blades were mounted on long shafts or had dagger hilts. Kind of surprised how long I spent grinding it! But I only had a bench grinder at the time and was probably being a little cautious. Nowadays I'd use my angle grinder more aggressively and get the whole darn thing done in an hour. 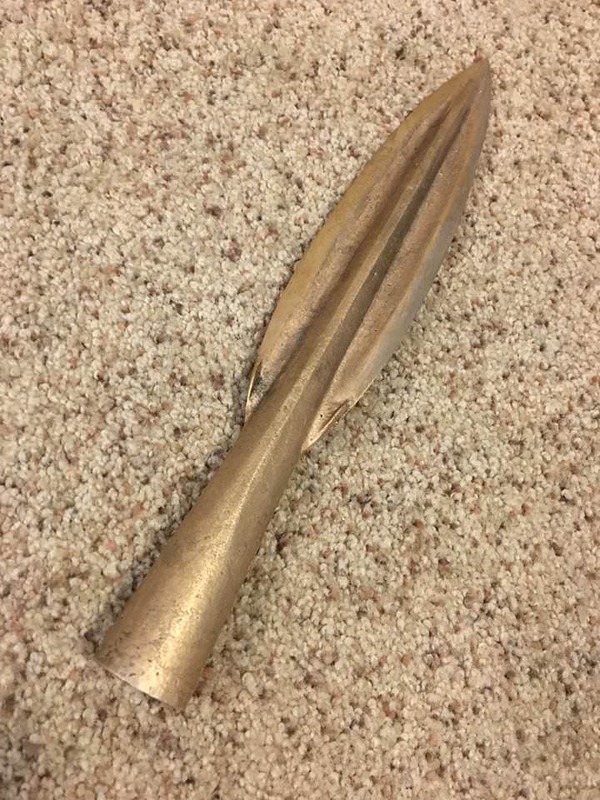 My converted blade is 9-5/8" by under 3" wide, the haft is 40 inches long. Finished weight is only 1-3/4 pounds. There are several Bronze Age stone carvings that show these weapons being used 2-handed by dueling warriors, but it's not very heavy at all. I like the antenna hilt sword, too, and it gets more use than many of my bronze weapons because I use it with my Romulus impression. 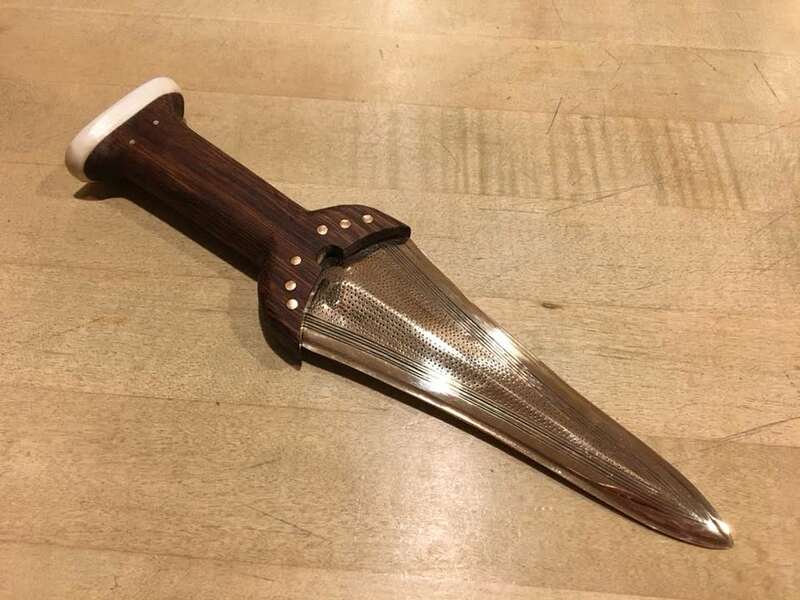 Neil makes it as a British piece, of course, but it was close enough to a couple Italian examples that I just used Villanovan grave finds for the scabbard fittings and called it done. It's a cool era, right on the transition from bronze to iron, so there are graves that both bronze and iron weapons. 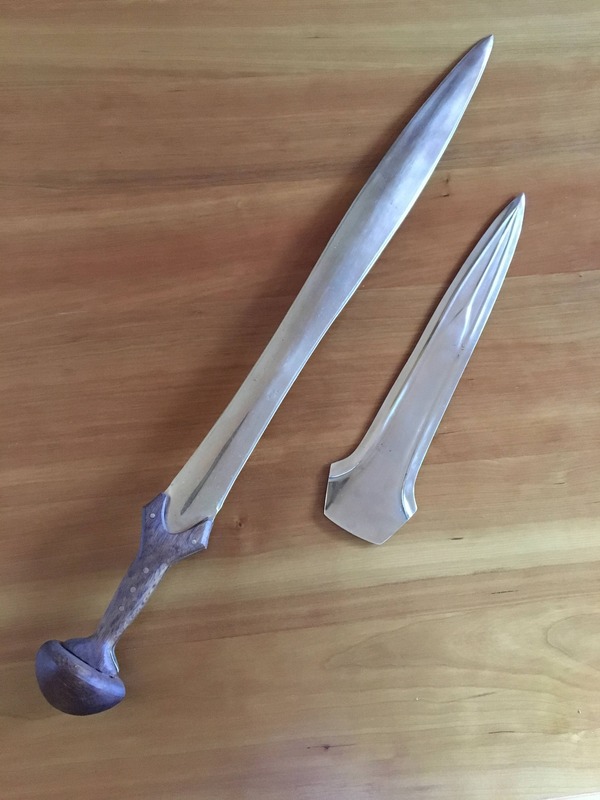 Hence the iron dagger that I made from scratch to go with it. 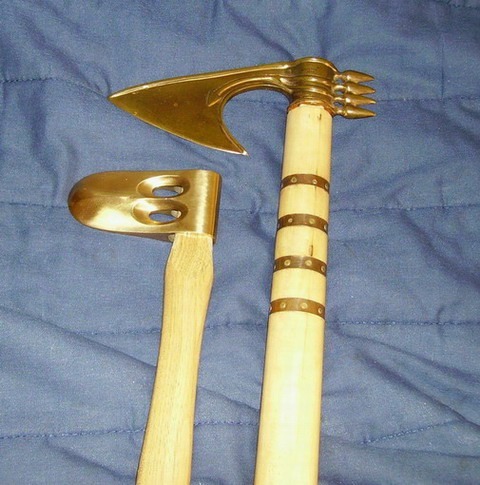 Huh, got at least a couple more axes that aren't shown, gotta dig through my photos! 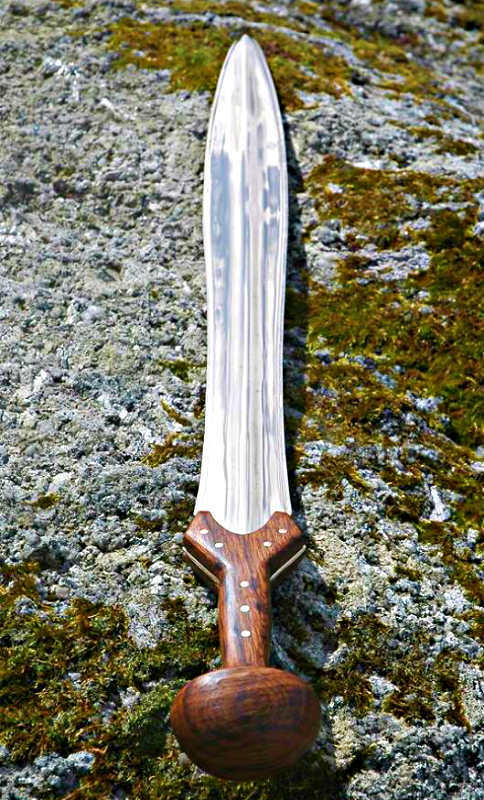 If somebody has a bronze Khopesh, I'd love to see it. Roger Hooper -- ask and ye shall receive (check the last two pics). Here is my current crop of bronzes, most of these are by Neil Burridge; the Canaanite Khopesh and Duck-bill axe are by Manning Imperial, and the "Assyrian" or Luristani axe is from Windlass. The great thing about these threads is that I can show them to my wife and say "See - my collection is rather modest in comparison!" 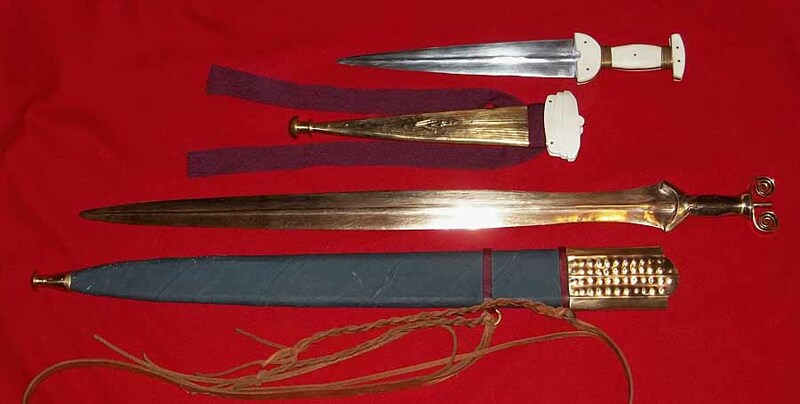 "Assyrian" or Luristani axe is from Windlass. 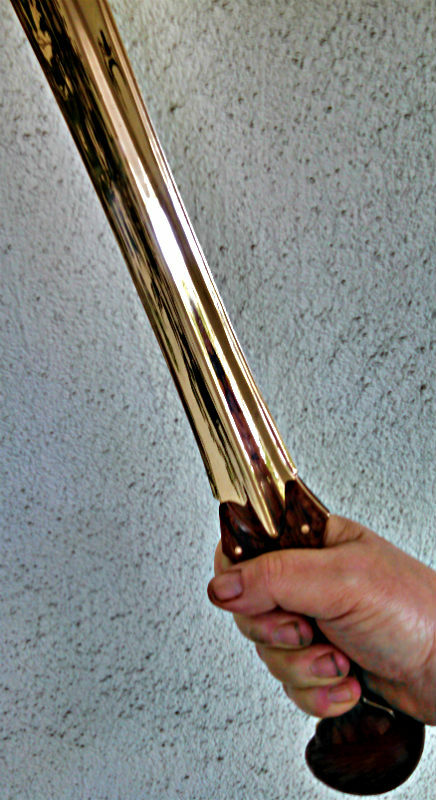 I was surprised and amazed by the pic of the Windlass axe, a product I wasn't aware of. As it is I happen to have one of those Luristani axes on display in my workplace in the museum where I work. Loved to see a picture of a shiny modern copy. Somewhat offtopic: a picture of a few originals. Right to left: 2 iron pieces that no longer (if they ever did) handle like swords. One nice bronze that's more like a big dagger though. The next one really surprised me when I picked it up: handling is absolutely stunning in spite of the missing furniture. Blade thickness increases slightly towards the "leaf" and tapers from there to the point. I'd estimate it weighs about 700 grams. Looks really good and it could easily be made fully functional again. 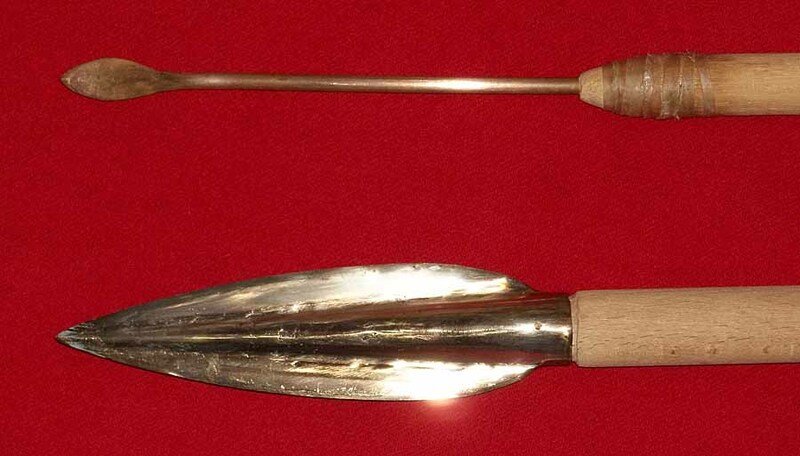 Check the very similar shapes of the bronze and the iron lookalikes. Not sure what's going on there. The iron one feels like a bit like a machete: what's left of it is a totally flat slab. 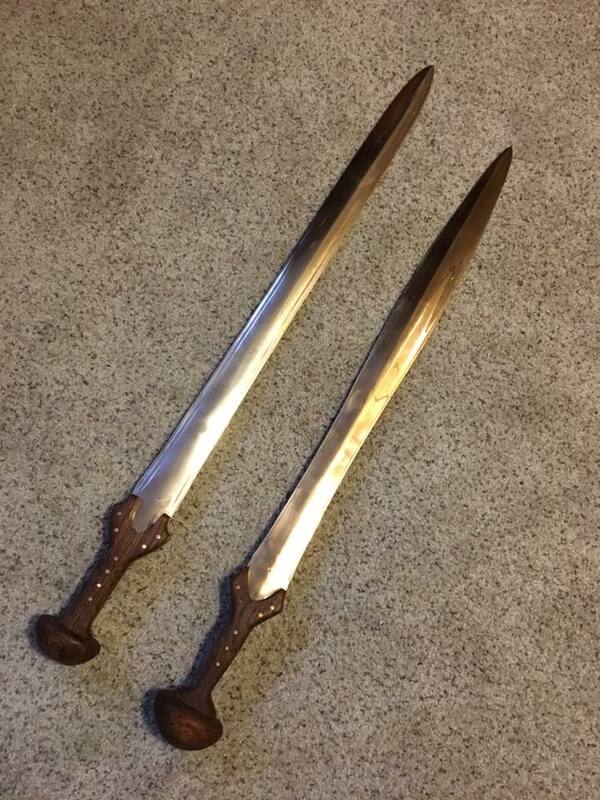 Next two daggers and next to those is the aforementioned Luristani axe. 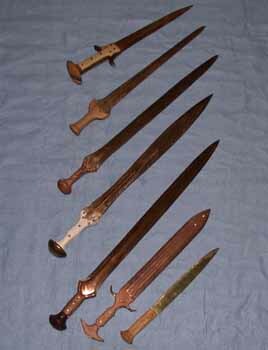 Supposedly all the swords, daggers and the axe are Luristan finds but I have no way to verify that. Aaron, you've really developed an extremely high quality collection and I love seeing it. Great job! Matthew, you've been the inspiration on a lot of my learning here, so it's always nice seeing your stuff. 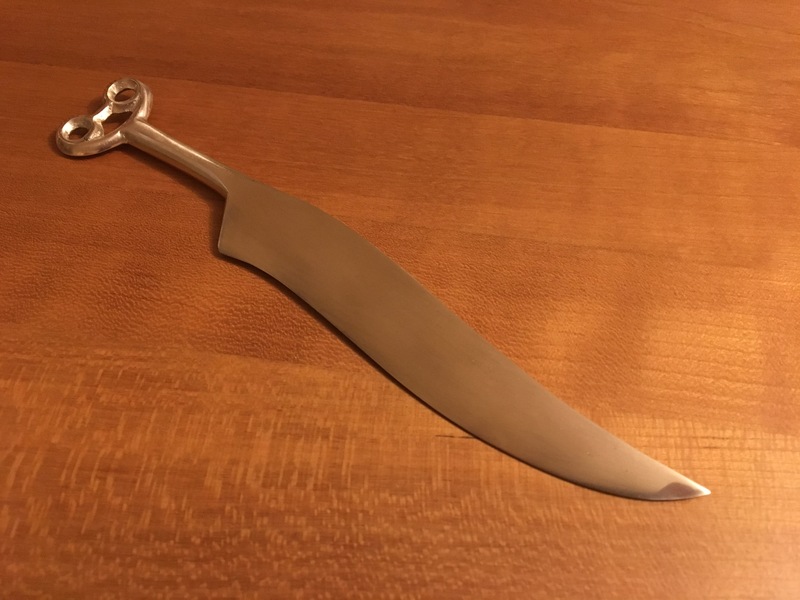 Roger, thanks for kicking this thread off, I will try to get a pic of my khopesh up for you. Stop, I'm blushing! You're very welcome, and it's nice to be around other crazy people!